Decluttering should be a priority, and just like any other priority in your life, you should schedule it. Make it part of your daily routine and book 15 minutes a day if you’re too busy for more. One of the hardest parts of decluttering is getting started. Looking at the mountain of junk that awaits you is understandably overwhelming, especially when you’re busy with work, kids or life. Because it’s usually not an enjoyable task, giving yourself a finite time limit for each session can help you get started and fit it into your day. OK, so you’ve booked some time out of every day and are ready to make decluttering part of your daily routine. Now what? If you’ve already read our article on organizing your basement, you know what’s next. You’re inevitably going to find that there are items you need to throw away / recycle, donate or sell. Rather than wasting time finding suitable sorting boxes or bags each session, set aside an area with prelabelled boxes or bags where you can put these items into. Once you’ve accumulated enough in each of these categories, guess what? Throw away / recycle, donate or sell them! Any items that you’re keeping should go back where they belong immediately. 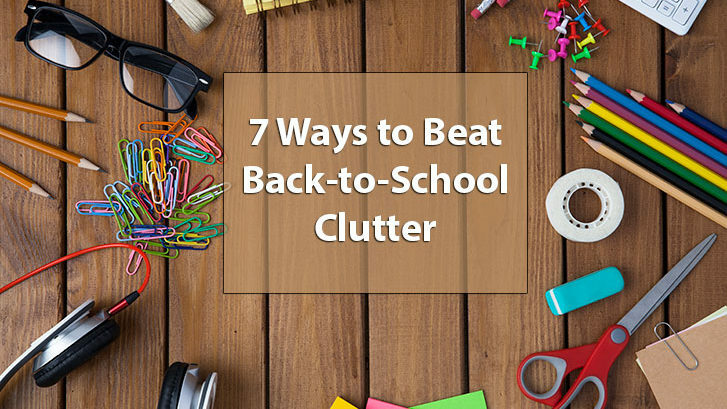 Don’t create a “keep” pile just so you can put those things away later. You’re just relocating the clutter! Alright, now your schedule’s set, and the empty “trash / recycle”, “donate” and “sell” boxes are begging for junk! Where do you start? How about forgetting about the house for now and starting with the car? Your car has probably been used more over the summer than it has been in the six months previous. This means that it probably looks (and worse, smells) like someone’s been cooking, sleeping and having a party in it for the last two. Because you’ll still need your car to shuttle your kids back and forth to school and probably yourself to work, do yourself a favour and start your decluttering efforts with your car. Recycle those juice boxes, plastic bottles and pop cans hiding under the seats and use commercial strength acetone to unglue the leaky juice container from the kids’ drink holder in the backseat. Throw the grass-stained pants stuck between the seats (so that’s where they went!) into the laundry and donate the smurf-sized clothes that have mysteriously appeared after a couple of years in never-never land. 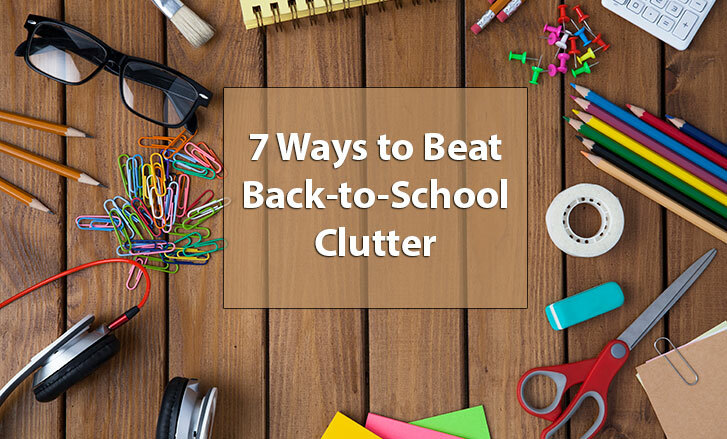 Next you’ll want to start attacking the clutter in the rooms that your family uses the most. Because these are the rooms you see most frequently, they’re also the most likely to cause you stress. They’ll also probably be the most cluttered and might even look worse than your car! Remembering that you’re only decluttering for manageable chunks of time, you’ll have to have a system of knowing where you started and ended each session. Starting at one entrance to the room and working your way clockwise can be an effective way of managing this so you can hit the ground running each time you start. Closets are typically a common dumping ground for most and will need special attention from you. In addition to junk you don’t recognize or thought was thrown out, you’ll find old, unused clothing that needs to make its way into the “donate” box. Children’s closets are a prime example of this. Because our kids are so active and grow so quickly, it’s common for their clothing to have a lifespan of a year or less. Remove their old clothes before you buy new ones for the coming school year. It will help keep your sanity intact when it’s time to put away the laundry. Donate any ill-fitting clothes to places like Goodwill or the Salvation Army. Re-purpose any clothes beyond repair as rags or quilts if you’re skilled with needle and thread. Recycle the rest at stores like H&M, who now take textiles for recycling in-store. How often does this happen to you? You squeeze through the front door of your house, gleefully announcing behind the two towering packages of toilet paper in your arms that you found them on sale just when you had run out! You’re abruptly greeted with a sympathetic chuckle and the reply from your husband that there are still twenty packages in the basement, and that he still loves you anyway. To prevent this, take stock of your existing school supplies (and toilet paper!) before you go shopping for more. Make this part of your routine when creating your shopping list, instead of just guessing what items you have left. Use your smartphone for something other than Candy Crush and make note of everything you have so you don’t buy duplicate items that will take 10 years to consume! Most of us don’t remember how many masterpieces of art we created and brought home ourselves when we were children. All of a sudden your own children are bringing you their beautiful (it’s all beautiful, isn’t it?) piece of art, and then ten beautiful pieces of art. At this point you have to ask yourself what your parents did with yours because you don’t have the heart to throw them in the garbage and yet you can’t keep them all, can you? Rather than having your fridge wallpapered ten times over with these Picassos, invest in some binders, magazine boxes or accordion type file folders to store you’re children’s artwork and paperwork. At the end of the year, keep only the most important items and take photos of the rest to show at your children’s wedding slideshows. No kids? Why have you read this far? (just kidding) No problem! Even if you don’t have kids, most of these tips still apply to you. We all have closets that are filled with clothes that haven’t seen the light of day in years. We all have bills and paperwork cluttering our desks and dining tables. And we all (ahem) need toilet paper! Peter Walsh, leader of Oprah’s “Clean Up Your Messy House Tour” says clutter robs us of life. Start decluttering, get rid of your junk and steal your life back.